Ensure a proper substrate. It is important to have a substrate that is flat and smooth, and of course free of any dust or other particles that will cause adhesion problems and telegraph through your finished project surface. Apply the glue. 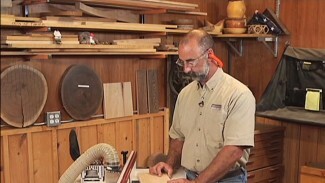 You’ll be surprised to see the “special glue” that George uses to attach the veneer to his substrate. You’ll want to spread it evenly across the surface, with enough glue to create a good strong bond consistently across the project piece. Better call a caul. 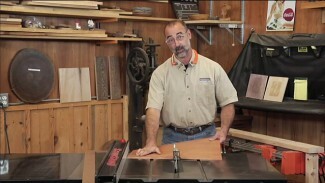 You will want to use a caul to distribute the clamping pressure evenly across the substrate. If you skip this step you could be sorry, as you might see bubbles in the surface, or have a bond failure at some point in the future. 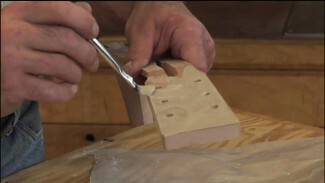 You’ll find that this goes pretty smoothly if you follow these steps, but ultimately if you determine that gluing veneer just isn’t your thing, there’s always the option for an iron-on veneer application. And when it comes to applying veneer, the most important thing is that you achieve the special look that you are after for your project. 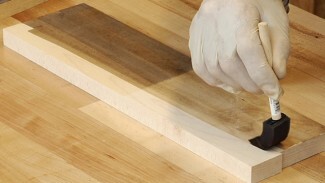 There are no bonus points for gluing veneer in one particular way if you feel more comfortable using a different method.